Association for Cultural Economics International (ACEI) conference at the University of Valladolid, Spain in June 2016. During the summer of 2016 three CREATe events took place in which economists working in the areas of culture, media and industrial organization were invited to exchange views on the transformative impact of digitization and the internet on the creative economy and to reflect on the implications of emerging trends for the future of the creative economy and for copyright. One of these events was jointly sponsored by the Association for Cultural Economics International (ACEI) at their conference at the University of Valladolid, Spain and a second was jointly sponsored with the Society for Economic Research on Copyright Issues (SERCI) at their conference at Loyola University Chicago School of Law, Chicago, USA in July. The third event was part of the CREATe Festival held in London at the Royal Society of Arts in June. We are delighted to announce that a dedicated resource page has been created to share the outcomes of these events. The rise of digital platforms has transformed the possibilities for the supply, demand and finance of creative products (ranging from art, archives, broadcasts and books to live music, opera and theatrical performances). Products of the creative industries which embody copyright works are now universally capable of being made available in digital form, while some also remain in ‘analogue’ form. With discussions taking place on the future of copyright law and how to reform it to meet these developments, it is important to link the economic literature to thinking about the future shape of markets for copyright works in the creative industries. Many of the topics studied in the economic theory of industrial organisation – platform pricing, network effects, long tail, price discrimination, customization – clearly apply to markets for creative goods and, indeed, the speakers at these events are some of the leading economists who have published research in this area. There is a perceived need for economists to ‘translate’ these theories for experts in other fields. Accordingly, the aim of this Working Paper is to report on the discussions and convey the conclusions to a wider audience. There was considerable agreement on the part of the speakers at these events about the changes to the creative economy wrought by digitization and the internet. There is undoubtedly a greater supply of creative goods and services which are cheap and easily accessible to consumers. To economists this in itself is welfare enhancing. On the supply side, however, there are concerns about finance for the primary creation of cultural goods and the increasing concentration of their distribution in the hands of entities that have little investment in their production or even interest in them. While the former incumbent firms in the creative economy, such as record labels, have lost out to the providers of services using new technologies, there are new incumbent players, whose role (if any) in incentivising cultural creativity is different. The growth of cultural supply has increased due to two basic features of the digital creative economy: one is the considerable reduction on the cost of producing, promoting and distributing creative goods and services and the other is the access that digitization and the internet offer to creators to self-publish and promote their work. Intrinsic motivation of creators and performers has flourished in these conditions, raising questions on the one hand about the quality of unmediated output and on the other about how sustainable the model is. Again, this has implications for copyright. Some evidence suggests that those who achieve success online may turn to the traditional gate-keepers for finance and services of production and distribution; that suggests that the superstar/winner-takes-all tendencies of cultural markets may thereby even be strengthened. But it is also the case that new technologies and business models can be adapted by creators and performers for developing their careers for their own purposes rather than that of a commercial intermediary. Another aspect is the sharing of expertise in product development between different contributors with no commercial incentive in mind (another type of intrinsic motivation). What the role of copyright in this mode of supply is or should be is something that economists need to research. The shift in control of distribution into the hands of online service providers gives rise to concern over two features: one, the ever-increasing oligopoly, even monopoly, power of these providers due to network and scale effects inherent in the technology, but also reflecting consumer behaviour; and second, the break of the link between creation, production and distribution, which affects revenues to creators and intermediaries. These features have implications for copyright as an incentive mechanism as well as for competition authorities. The economic aspects of the effect of the switch to platforms on the production and consumption of creative content can be summed up as: the effects on costs and prices, including zero prices; the technological characteristics of networks and scale on markets and on the economic organization of production, including at the level of content creation; and the role of distributors, some of whom are self-publishing primary creators but more significantly, businesses that increasingly are not the incumbent intermediaries. The economics of platform pricing and non-price competition has become complex with implications for both creators and intermediaries as well as for regulators (competition authorities and copyright policy-makers). For economists one of the most significant changes has been to business models as licensing takes over from sales, resulting in the development of two-sided, even multi-sided, markets. So far the main action has been competition between freemium and subscription models, with several types of the latter, such as ‘á la carte’ and ‘all you can eat’. In both, content is bundled, increasing consumer choice while at the same time blunting the incentives to the creators, who are paid a uniform (low) royalty. Two-sided markets in which advertisers play a significant role in financing distribution, in which ‘poorer’ consumers tolerate the ‘bad’ of advertising to obtain the goods they wish to access, are becoming vulnerable to developments such as adblockers that reduce the incentive to this form of finance. For some goods and services, that might suggest government intervention to ensure supply to achieve cultural policy objectives. The role of intermediaries as gate-keepers and financiers has changed; online quality evaluation is now provided by aggregators and as costs of production and marketing via internet have fallen, self-publishing has become feasible and even profitable for some. It remains to be seen if this trend continues and whether markets for content become more or less dominated by superstar/winner-takes-all effects. Cultural economists tend to believe they will, based on the analysis of markets in the creative industries and consumers’ switching costs. This has welfare implications for cultural diversity and policies for protecting national cultures. On the other hand, new entrants and multi-homing can counteract the effects of concentration. Overall, there was a high degree of consensus among the speakers about the effects of digitization and the internet on the creative economy. Perhaps predictably, economists differ as to the ability of market forces alone to bring about an overall improvement in welfare from ongoing innovation and adjustment in the creative economy in the medium to long run. Some have greater faith than others in the ability of market incentives and innovation to overcome perceived negative effects of digitization and the internet but those who incline more to intervention through competition, copyright and cultural policies also recognize that the dynamic effects of technological and business model innovation make intervention difficult to gauge. Overall, the implication for copyright is that, on balance, there is no case for increasing the copyright standard and, if anything, it makes the case for weaker rather than stronger copyright enforcement. The main reason is the reduction in costs of producing and distributing content and the increased benefits to both consumers and producers of network effects. On welfare grounds that undermines claims for greater protection. ‘A Future for the Creative Economy’ resource page provides access to a video of the panel session and a Working Paper describing the proceedings. 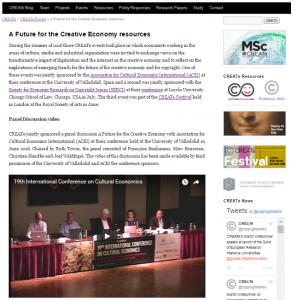 Resources from the events include a video of Ruth Towse’s panel session ‘A Future for the Creative Economy‘ at the 19th International Conference of the ACEI and a working paper of the same title summarising the panel proceedings. These are both accessible from the event resource page. Professor of Economics of Creative Industries, Centre for Intellectual Policy and Management, Bournemouth University and CREATe Fellow in Cultural Economics (University of Glasgow). Research interests: economics of copyright, cultural economics, artists' labour markets. Current research: copyright and business models in music publishing.